Our next game under 14 hurling game is against Mt Sion on 21st July. We also had a number of our Under 14s on duty for the county team in the Jim Power Football Tournament against West Cork and South Kerry last Saturday. 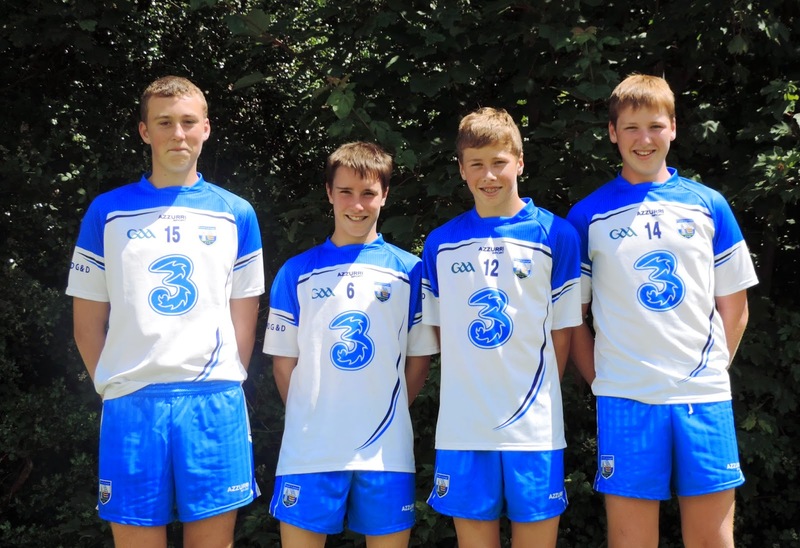 Daithi Brunnock, Ben Flynn, Shane Kiely and James Riordan were our participants. L to R: Shane Kiely, Ben Flynn, Daithi Brunnock & James Riordan. We received a walkover from An Ghaeltacht last Thursday evening, next game in this division is at home to Lismore on 14th July. Well done to Michael Kiely on a fine display to be runner up in the Larry Quinn County hurling skills last Thursday in Dunhill. Our underage outdoor hurling continues this Saturday morning the 5th July at the Burgery at 10.30 am. All are welcome. This covers all age ranges from under 5 to under 10. Anyone who has not paid their membership yet is asked to pay it on the morning for insurance reasons. Membership forms will also be given out on the morning. Helmets are compulsory and if required can be purchased at a reduced price of €50. There will be a €2 cost also to cover expenses. Our under 16 hurlers played Lismore in our club grounds on Thursday night last week and after a very entertaining game came away with a one point loss. Our minor hurlers played the first round of their championship last Wednesday night and came away with a seven point victory over Brickey Rangers. This was a fine display from one to fifteen and we thoroughly deserved victory in the end.